Top Stamford criminal defense attorneys would agree that the charge of interfering with a 911 call is a very frequently alleged allegation in domestic violence cases in Fairfield County. The reason why domestic violence crimes have such a large proportion of interrupted 911 calls is due to the very nature of domestic violence disputes. When people are fighting or arguing in a domestic violence situation it is typically with a spouse, boyfriend/girlfriend or family member who is either inside the home, in a car with or right next to the victim (person making the 911 phone call). This is a much closer relationship than typical crime reporting situations where for example you may be making a call about a suspicious person outside your home. The intimate relationship in domestic violence cases provides the access to reach out and grab the phone out of the hands of the victim and interrupt the 911 call in the hopes of resolving the matter without Police involvement. However, once the victim has picked up the phone and calls 911 it is too late and you can NOT make any efforts to stop the phone call under Connecticut law. Any attempt to hinder or prevent someone from making a 911 call is a class A misdemeanor in Connecticut for which you can face up to a year in jail, significant periods of probation and hefty fines. Connecticut Courts and State’s Attorneys take interference with 911 calls very seriously because often the cases where 911 calls have been interrupted are ones where victims have suffered significant injuries. For this reason no matter what the factual scenario if you have been charged with interfering with a 911 call you need to take the case very seriously. In 90% of the cases we have seen for interfering with a 911emergency call there are additional charges that go along with the 911 call charge. Usually, these type of cases involve domestic violence arrests and some of the charges we typically see associated with interfering with a 911 emergency call include assault, strangulation, breach of the peace, disorderly conduct and threatening. Therefore, it is very important to hire an experienced Stamford domestic violence crime lawyer who understands this complicated area of law, including all of the defense strategies which could be used the resolve your case. Allan F. Friedman can provide skilled and effective legal representation to people charged with domestic violence offenses in Stamford, Connecticut. C.G.S. Section 53a-183b is the statutory citation for interfering with a 911 emergency call. One general observation is that this statute requires a mental element of an intention to prevent another from making a 911 emergency call. So if you accidentally or mistakenly hung up on a 911 call then you would not be guilty of this crime. The State needs to be able to prove that you acted with the intention to terminate a 911 emergency call. It should be noted that the statute covers phone calls and radio communications. In 25 years of practice I have yet to see someone arrested for interfering with a 911 radio communication but I imagine that may have some relevance in the boating and aviation world. Top Stamford criminal defense lawyers would agree that there are two main methods to violate this statute. The statute makes it illegal to interfere with a 911 emergency call by either physically or verbally preventing or hindering someone else from making a 911 call. Physical Interference with a 911 emergency call. This entails grabbing the phone out of someone’s hands, tearing the cord out of the wall, pushing the button to end the call or taking any other physical act which ends the call of cuts the call off, or in extreme cases the actual choking or strangulation of the victim to prevent them from speaking. Verbal interference with a 911 emergency call. This kind of interference can cover a wide range of possible scenarios. Some of the situations we have encountered are people screaming at the victim and telling them not to call the Police and threatening them. Others can be someone yelling loudly during the 911 call in an attempt to prevent the victim from being able to communicate with the Police. Finally, verbal interference would apply in situations where the accused incapacitates the victim and then takes over the phone call and tells the Police that everything is fine and there is no emergency. As mentioned above this is a class A misdemeanor which is the most serious level misdemeanor offense for which you can face up to a year in jail, significant periods of probation and a fine of up to $2,000.00. Interfering with a 911 emergency call is not a domestic violence crime. However, as most top Stamford criminal defense lawyers will tell you it is a charge very frequently tagged on to domestic violence arrests. Risk of injury to a minor and interfering with a 911 emergency call are the two most frequently charged additional crimes in domestic violence arrests. Typically, domestic violence situations are very volatile and emotions are running hot. It is not uncommon in the heat of an argument for someone to threaten to call the Police and then not do so. Often we have seen situations where a victim tauntingly calls 911 and then immediately hangs up the phone themselves right away before completing the call. Often this triggers the Police to send officers to the home for a welfare check. In these situations there can be a lot of finger pointing about who called 911 once the Police get there and disputes about who did in fact hang up the call. When the victim claims that you hung up the call you are going to get arrested for interfering with a 911 emergency call even if you had nothing to do with it. If you are innocent of the allegations the defense strategy needs to focus on the facts. Were there any witnesses of the alleged interruption of the 911 emergency call or is it simply a he said / she said situation? All 911 calls are recorded so in some cases the call recording can be useful evidence to support your defense case. Because in 90% of cases that we see arrests made for this charge it is bundled in with other domestic violence charges it is important to take an overall approach to resolving these kind of cases. If you are facing additional charges the best approach is to come in for a free consultation so we can review all of the facts of the entire case, your criminal history if any and develop a case strategy to tackle all of your charges. Of course our objective is always to seek a dismissal of all of the charges that you are facing and avoid any permanent criminal record. If you are a first time offender you may be eligible for the accelerated rehabilitation program which is a diversionary program. If you have not previously used this program in the last 10 years you can apply for the program. The program essentially provides an opportunity to have the charges dismissed if the Court finds that the charges are 1. “not too serious” and 2. “you are not likely to offend again in the future.” It is a great way to get the charges dismissed and preserve your clean criminal record but it can get complicated when you have additional domestic violence charges pending at the same time. In these situations careful planning and strategy by an experienced Stamford criminal defense attorney is critical to achieving a global solution to the entire case. Let Us Fight Your Interference with a 911 Emergency Call Arrest! We always provide you a free initial consultation. 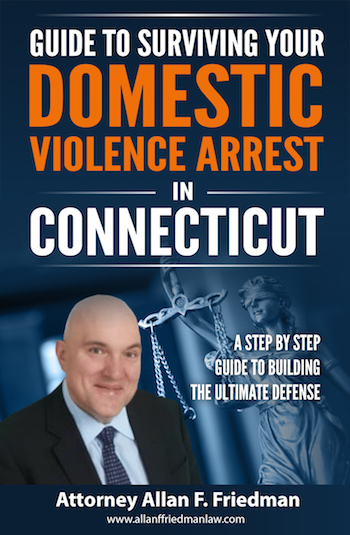 I have 25 years of experience defending criminal charges throughout the State of Connecticut. During your initial consultation we will go over your goals of the representation which are usually a dismissal or a reduction of the charges and go over any special concerns that you may have. Hiring an experienced Stamford domestic violence attorney can make the difference in having your case dismissed or reduced down to a lesser charge. If you have been arrested for interference with a 911 emergency call in Greenwich, Norwalk, Stamford, Cos Cob, New Canaan, Darien, Fairfield, Westport, Weston, Wilton, Bridgeport and throughout the County of Fairfield do not hesitate to contact the Law Offices of Allan F. Friedman. We work on a flat fee basis and our rates are reasonable. We offer payments plans as needed. Call Attorney Friedman at 203.515.4110 to schedule your free initial consultation we are available 24/7. Or you can contact us online for a prompt response.